The Shift Racing Double Bypass helmet has been around for a bit now. It’s a delicious stack of cheesy, burger helmet goodness. So what do you think? Love it, LOVE!! IT!! or… eh, whatever? I can has cheezburger? Yes, please! 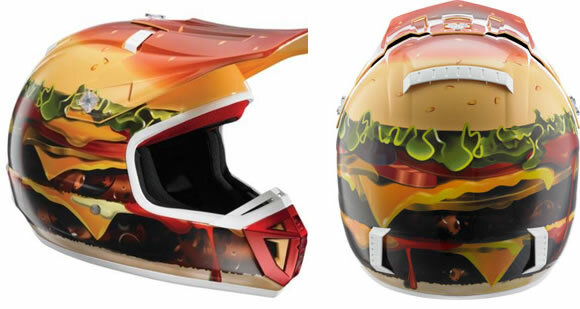 Mouthwatering helmet. Fries with that? I tried this helmet on in a store – quite possibly the heaviest helmet ever made. Probably weighed a good 85 lbs. Aww! What a bummer to hear that!